Websites are the business card of the modern day. Every small and large business needs one. Some businesses are lucky enough to have tech-savvy employees on board to guide them through the website creation process, and others are forced to depend on their web developer as their sole source of information, guidance and direction. I consider the second group to be the less fortunate since it requires much more trust, and therefore opens up just as many opportunities to be taken advantage of as going to a mechanic with little or no knowledge of cars. Because of this, picking the right development agency is absolutely crucial, and reviews and first-hand accounts of past clients could very well save someone from potential disaster. 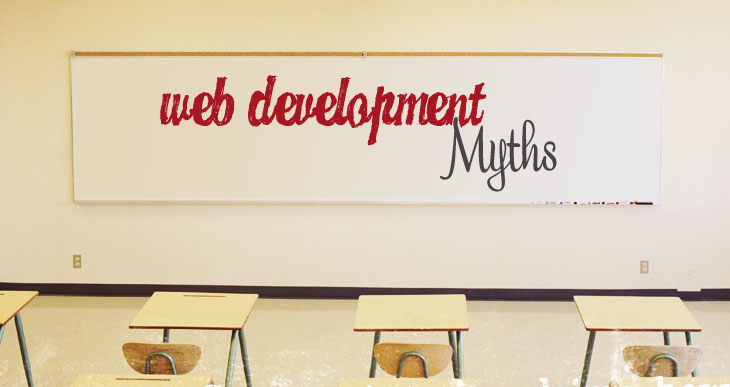 Over the years of working in web development, I have come up with the top misconceptions and myths that clients have had about the web development process. This is not true. A rough outline of the basic sections and functionality are really all that is needed to get a site started in the design and development phases. Plugging in the content later is never a problem as long as it doesn’t change the main architecture, like adding an entire new section to the site for example. Very often clients send back design samples because of misspellings, missing words or paragraphs, or because they feel the proper message was not conveyed with the perfect language. In the design phase, the only thing the designer focuses on is design elements like colors, placements, borders, images and navigation. Usually designers will put dummy, or mock text (lorem-ipsum placement text for example) as placeholders. Often this text is confusing to clients, as they feel something went wrong in the design phase. I’ve actually gotten responses like “I wanted the site in English, not Latin” or “I think the sample is broken, the words are all jumbled.” Remember, designers simply design – it’s not until the site is almost finished in the development phase that the final content needs to be ready. Any knowledgeable and honest web developer needs to be very up front with clients – stock images are NOT free. Most stock images on the internet are property of a photographer or other artist. Honest developers get the rights to use these images by paying for licenses on stock websites like ShutterStock.com and iStockPhoto.com. Usually these images are pretty cheap, a few dollars per image (depending on the size and resolution.) For most websites, if there’s only a few images to be used and the cost is low, good consideration would guide a development agency to throw the stock photo licenses in with the cost of the website. However, large websites that use a lot of images should be aware that these do cost money and it’s not unusual to incur an extra fee for them. If you’re reading this, chances are that you fully understand how to navigate the web, Facebook, Social Media and you understand how to click a link, hover over a button and not to hit refresh 10 times while a website is trying to process your credit card. However, it is NOT safe to assume that all web users share the same love (or knowledge) in the internet-driven world that we do. When working with a web development agency to come up with the perfect website, always keep in mind that your main concern should always be delivering your message, product or service in the least restrictive and least confusing way possible. For example, big “call-to-action” buttons like “Buy Now” might seem at first glance to be gaudy and silly, however they do serve their purpose in grabbing attention and making the buying process simpler for all users. 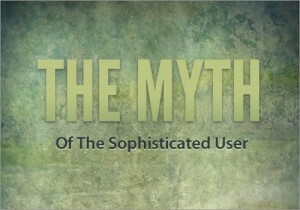 Keep these users in mind when planning your website. It’s understandable that clients who pay a premium price for a website want nothing but the best and quickest service. However, in it’s barest form, web development is computer code typed by a programmer. Coding take time, especially when it comes to unforeseen changes and additions. Estimated timelines should be fairly conveyed by the developer and discussed openly. Obviously there are a few bad web developers that take way too long, sometimes a year or two, just for a small / medium website – that is absurd and besides the point.Â With all this said, I’ve heard the line “this should be simple” coming from clients enough to say that sometimes things are simple, and other times coding is not simple and just takes time to perform accurately and without problems. Remember, quick and dirty can sometimes mean quick and buggy. Adequate time should also be allowed after development is finished for final testing of the site, which must be thorough. I compare websites with buying your first starter home – although it’s great and amazing when you first get it, you’ll soon start wanting to change it. 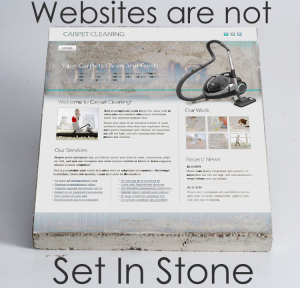 As any homeowner knows, the changing and tidying up never ends, and this is also the case for websites. Website contracts usually end when everything promised is delivered as agreed upon by both the web client and developer. However, all websites are open-ended for changes and additions at any time in the future, obviously charged on a separate schedule agreed upon by both parties. You should never feel hesitant to launch a site simply because it’s not 100% absolutely perfect – a good idea is to get the site up when you’re comfortable enough, begin getting traffic and users, and deal with the changes later. Change is an ongoing process. As with most developers creating any computer code, whether it be a client app, mobile app or a website, debugging errors is just a part of the game. Towards the end of the process, usually the client and developer work together to go through every inch of the website, and often issues and problems pop up. This is natural and usually easily dealt with. Clients should be aware that developers tend to view the severity of problems a bit differently than clients do, simply because some issues affect large parts of the site, causing outages and functionality problems (these are called errors and bugs) and other issues are very simple and require a few seconds to fix, like color changes, font styling changes and typos. The key here is to work together to prioritize the fixes in a reasonable timeframe. Usually web developers and clients work closely in the planning phase. Sometimes the next step, the design phase, brings up some points that require some rethinking of the website’s structure. Once development has begun, all of the large features should be firmly understood and nailed down because considerable amounts of time and effort go into making these moving parts work together. Big changes very late in the game can adversely affect the development process, expected time of launch and sometimes the cost of the project as a whole. This can be compared to building out 80% of a car before realizing that you wanted a diesel engine instead of a gasoline engine. The distinct difference between a Mobile Website and a Mobile App is that a Mobile Website is simply a regular website, reformatted for the browser of a mobile device. You can see a Mobile Website in action by going to NJ Transit or CNN’s website from your mobile device. You are actually using a web browser to navigate the mobile site, but the content it delivers should be nearly the same as the full website you’d visit on your home computer. A Mobile App is an application that you download from a marketplace like iTunes or Android Play Market. Mobile Apps install onto your device and take up space on your device. 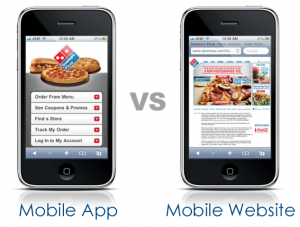 Usually mobile apps are quicker and more flexible than a mobile website because they aren’t restricted by the constraints of the browser of the device. Also Mobile Apps can visually be more consistent across platforms, like iPhone and Android, since they can’t be changed visually like a Mobile Website can by the browser itself.